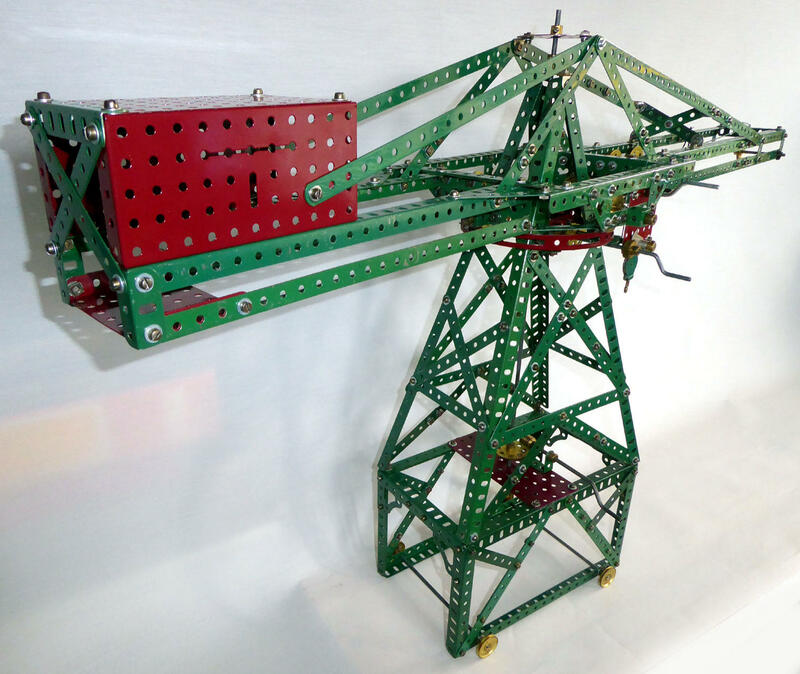 This Travelling Gantry Crane model was built using parts from my circa 1930 Number 7 red and green outfit. 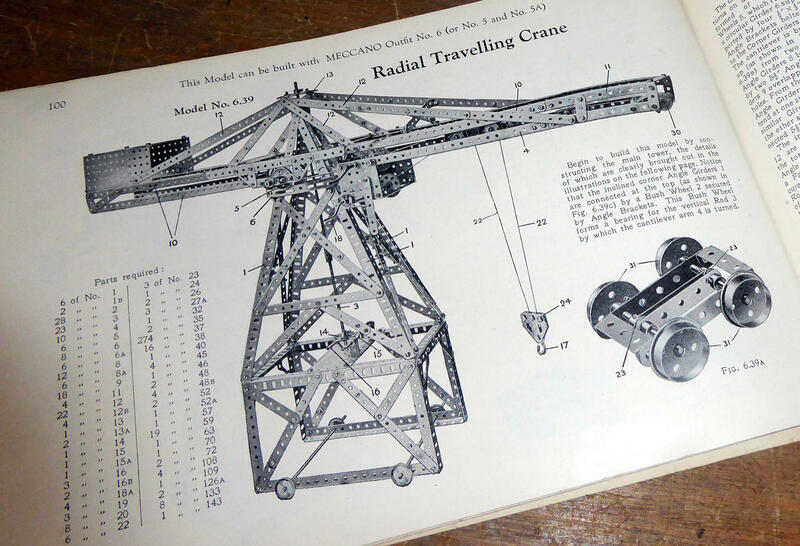 The crane is shown in the 1929 Outfits 4 - 7 instruction manual I am very fortunate in owning a near perfect copy, which came with the No. 7 outfit. The modle first appeared in the 1925 all outfits instruction manual. I made several modifications to make the model fit together but nothing that detracted from the look of the original. There is a conflict between the illustrations, instructions and parts list. One odd thing is the top and bottom of the boom has 3 hole strips that slope in at each end but they just can't do that as the top and bottom are the same length. 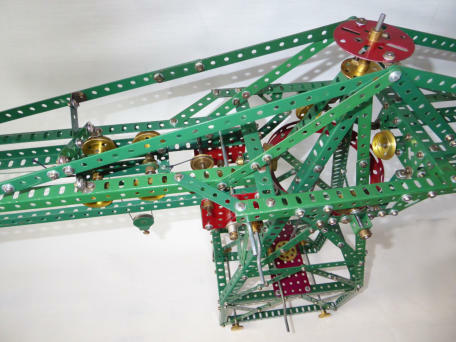 I used a paw and ratchet (included in the No.6 set) for the hoist rather than the strap brake shown, also used 1" pulleys both ends for the trolley travel wrapping the cord several times around the crank rod as the instructions just did not work but twice around a pulley worked a treat. 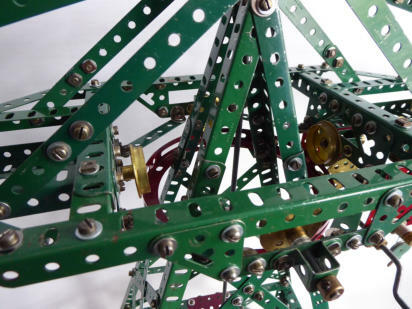 The single sheaf pulley block is from the No.7 set the only outfit it was included in. I like these parts yet Meccano hardly ever featured them in instructions, using built up blocks instead. 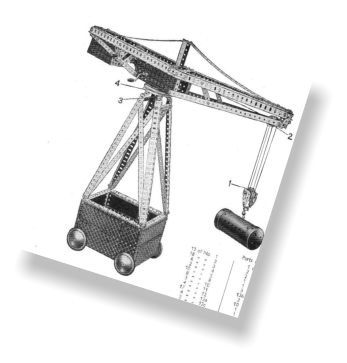 I thought the construction of the crane was well thought out and very robust particularly the main roller bearing using the circular girder and large flanged wheels but the circular girder (p/n 143) was a very tight fit and needed everything to be well slackened off to fit it. The instructions stated it was fitted using 1/2" x 1/2"angle brackets but the picture shows 1x1/2" brackets, only two of the brackets can be bolted to the ring the other two just support, all very frustrating for the 1929 Meccano Boy I am sure. 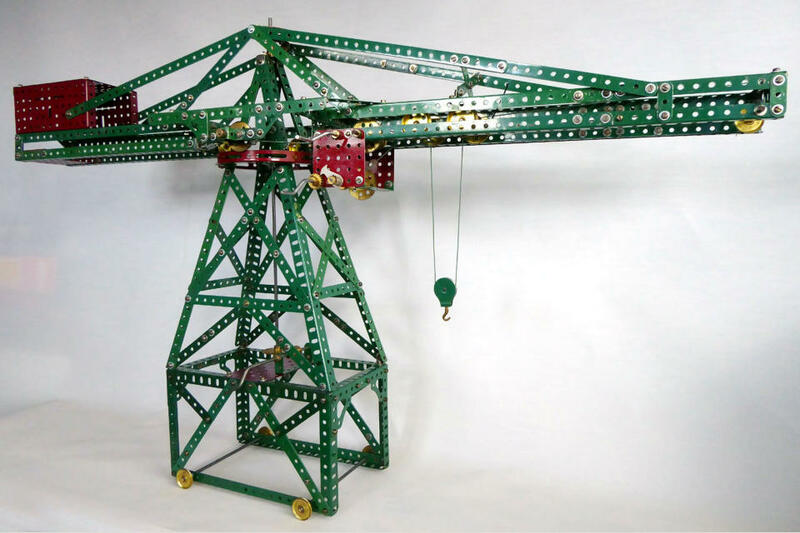 The functions of crane all work well it is a pleasing, attractive and functional model. well worth the effort to build. 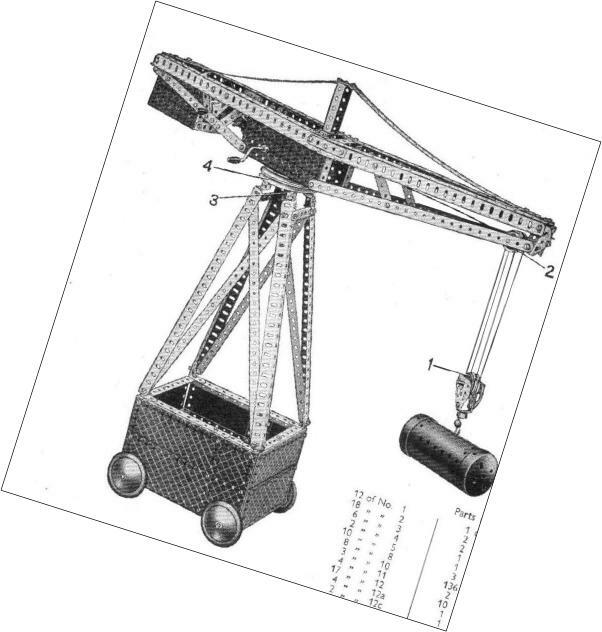 The crane itself does not, as far as I can find out appear to be based on any prototype although I did find a picture of an old block setting crane with a very similar boom. A page from the original 1929 instruction manual is shown below. The 1937 7/8 manual showed a new Radial Travelling that must rate as one of the worst Meccano models ever, an insult to the 1929 version.